Although counting is not finished, the Liberals look like they have lost their blue-ribbon seat of Wentworth to independent Kerryn Phelps. Even if they hang on, the Liberals have suffered an historic swing of nearly 20 per cent. It is clear that the government is all but finished. Scott Morrison will now face even more infighting and chaos—but the Liberals are likely to grow nastier as they desperately try to hang on to power. Since taking over as Prime Minister, Morrison has staggered from one blunder and embarrassment to the next. 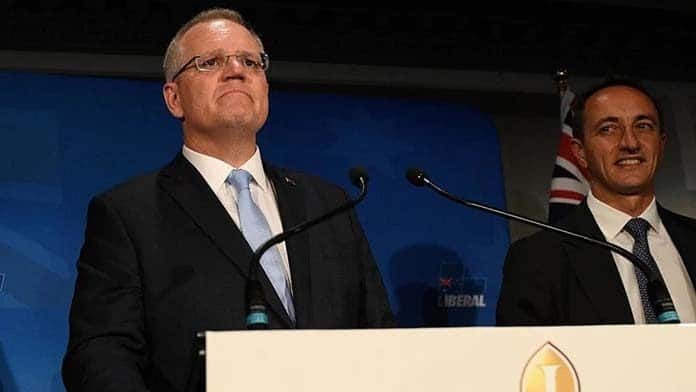 His defence of discrimination against LGBTI teachers following the leak of the “religious freedom” review, as well as the government’s lack of any climate change policy after dumping the national energy guarantee both hurt the Liberals in Wentworth. The Coalition will try to limp on, with the support of conservative independents Bob Katter, Cathy McGowan and now Kerryn Phelps. All of them have told the government they will support them over motions of no confidence. But if the Liberals are pushed into minority government, the pressure for an early election will grow. The sooner the Liberals are kicked out the better. And a general election is a matter of months away at most. Scott Morrison and the Liberals are likely to move further to the right, ramping up the government’s racism and attacks on migrants for causing “overcrowding”, and boosting their scaremongering about refugees. Morrison’s hasty effort to follow Donald Trump and move Australia’s embassy in Israel to Jerusalem is just one more example of his willingness to kow-tow to the right. The Liberals’ vote for Pauline Hanson’s “it’s ok to be white” motion in the Senate last week was no accident, despite their claim the next day it was an “administrative error”. Official government racism and Islamophobia for years has encouraged the far right. With Labor now odds-on to win the next election, the focus is on what a future Labor government will deliver—and the struggle from below that will be needed to turn back all the anti-worker, anti-refugee, anti-LGBTI policies the Liberals have inflicted in the last five years. Bill Shorten has nudged Labor to the left, with modest promises to change some of the rules on industrial relations and overturn the Liberals’ penalty rate cuts. But getting Labor elected will not be enough to undo the years of neo-liberalism and racism that we have endured under Abbott, Turnbull and Morrison. The rallies in Sydney and Melbourne—on 23 October over workers’ rights and 27 October to close Manus and Nauru—are now even more important. The unions have to defy the threat from the Fair Work Ombudsman of fines against unions and individual workers for taking industrial action for the Change the Rules rallies on Tuesday. We will have to break the rules to change the rules and re-establish workers’ right to strike. Even as the Liberals face defeat, BP is taking action to terminate the enterprise agreement at the Kwinana oil refinery in Western Australia. The threat from Fair Work is more evidence of just how much power Fair Work and the bosses have over workers. Labor plans to keep the Fair Work Commission—and some union officials are suggesting giving it even more power to arbitrate over disputes. Workers do need a pay rise, as the union campaign says. But we will need more than Tuesday’s rallies to get the pay rise we need. Workers need the unrestricted right to strike to have the power to win pay rises and defend conditions. Shorten’s backflip to support the TPP is more evidence that Labor’s leaders can’t be trusted even to implement party policy. When they talk about policies being in the “national interest”, they really mean the bosses’ interests. Similarly over refugees, Labor says it will get everyone off Manus and Nauru. They say they will accept New Zealand’s offer to resettle 150 refugees. But that still leaves hundreds of people on Manus and Nauru in limbo. Like the Liberals, Labor’s talk about “third country resettlement” is just empty talk. They don’t have any third countries. The strength of the refugee movement has forced Morrison to bring dozens of kids off Nauru. But it is not just kids who have to be brought off. After five years, many people are sick and everyone needs their freedom. The rallies on 27 October are crucial to maintaining the movement that can bring all the refugees and asylum seekers from Manus and Nauru to Australia. Labor has called for legislation to stop LGBTI kids being expelled from private religious schools; as well as to protect teachers and staff from discrimination and the sack. But we also need to restore the Safe Schools program that was dismantled by the bigots in the Liberal Party. Teachers will need to organise and strike to stop NAPLAN and win proper funding for public education. When we drove the Liberals out of office in 2007, the Rudd Labor government replaced his anti-union WorkChoices laws with WorkChoices Lite, leaving many of the anti-union restrictions in place. We are still paying the price. We need more than a National Energy Guarantee to stop carbon emissions and climate change. Relying on the market to deliver action is doomed to fail. The power industry needs to be re-nationalised. Climate action requires government investment and action to close coal-fired power stations, as well as boost renewable energy and green jobs. The Royal Commission into the banking industry and the scandals in aged care have revealed the greed, corruption and abuse that sustains a system driven by profit. We need more industrial action and protests to finally get the Liberals out. And we need much more than a Labor government. Labor wants to run the system. But without challenging the power of the corporate bosses, inequality will continue. We need a stronger union movement and stronger social movements to take the fight to the bosses and fight for a socialist system that produces for human needs, not for profit.